I've never considered myself to be a person who covets things. I have sold, given away, or discarded more gems than I care to remember ( Moschino logo belt can you hear me?) But as I get older and more fashion wiser I'm learning to appreciate vintage more and more. 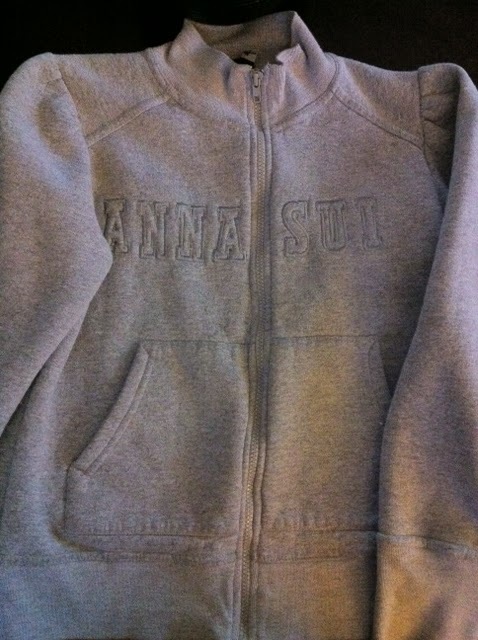 While my zip up Anna Sui sweatshirt might not be considered vintage in vintage terms, it is my baby. One of the oldest pieces of clothing I own and the most comfortable. I purchased it from the now defunct ELuxury website, the Net-A-Porter of it's time, for only $80. I've worn it countless times, under coats and as a coat. With jeans and leggings, leather pants and leather skirts. I will not call it weathered, but let's just say it's nicely broken in feel adds to it's appeal. There was a bit of a scare last year with a broken zipper situation, but thankfully it was mended to perfection. If Anna Sui ever produces it again I promise to buy another, but it will only act as a stand in to the sweater I own now. Because now I understand the importance of holding on to things. The aforementioned Moschino belt? I got it at Century 21 back in 1997 for $40, it came back last season and is available for around $400 (sighs). As the saying goes, it's cheaper to keep her. P.S.- Tell me what you can't live without and why! oddly enough though, if I were to pick one, it wouldn't be Nikes, Jordans, or anything else. Low top, black and white converse. I wear them until the fabric is filthy, then I just spend 20 bucks and get another pair. lol I can wear them with so many things and they are timeless. Dub I feel the same way about them chucks! I wear them to death, classic!